The All New 2016 CX-3 is tailored to deliver a rich driving experience while pampering passengers with luxurious touches. Interior materials, fit and finish look and feel as elegant as they are forward-thinking, from the dark red seat stitching to the soft touch materials. This all new dimension of crossovers gets interior swagger from its big brother, the award winning Mazda CX-5. The Mazda CX-3 offers; All Wheel Drive, Leather, Navigation, Moonroof, Lane Departure, Adaptive LED Headlamps, Blind Spot and Cross Traffic Monitoring and Bose Surround Sound to name just a few class leading features. Visually, the new CX-3 has a bold athletic look that emphasizes the CX-3’s stylish proportions. The grille boast a sense of speed and power that flows over the entire body. All CX-3 comes with Mazda Connect standard with a 7-inch, full-color touchscreen infotainment suite that is integrated with a commander control knob and Bluetooth hands-free phone pairing and audio streaming. Mazda Connect helps keep drivers and passengers safely connected, integrating phone controls, radio, internet radio services like Pandora and Aha by Harmon, and available navigation into a single system. All 2016 CX-3s include a backup camera and push-button starter as well as power windows, power door locks, and keyless entry. 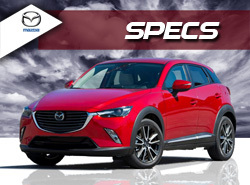 The All New Sporty 2016 Mazda CX-3 Compact SUV is here and it’s exciting, fun-to-drive attitude is undeniable. From it’s voice activated navigation and audio system to it’s intuitive ON-DEMAND ALL WHEEL DRIVE, the Mazda CX-3 is State-Of-The-Art and fuel efficient.